The following promotional materials were created by EBSCO. All of the items can be printed on a standard 8.5 x 11 piece of paper. Some of the posters can also easily be printed on larger paper. Item names that are followed by an asterisk (*) are customizable PDF documents. This means you can add addition information to the document such as the library’s name or instructions on how to access the database. If you have problems customizing a PDF document, please see the information on Customizable PDF Documents. 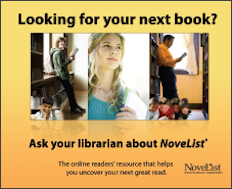 NoveList Plus - Looking for a good book? NoveList K-8 Plus - Looking for a good book?